Mayor Bloomberg has finally found success in his fight against sugary drinks in New York City!!! Legislation has just been passed, banning the sale of sugary drinks in containers larger than 16 ounces in public venues such as restaurants, movie theaters, sports arenas, food carts, and delis. Supermarkets and convenience stores will be excluded. The city will fine sellers for violating the ban beginning June 2013. Bye, bye "small" 32 oz. 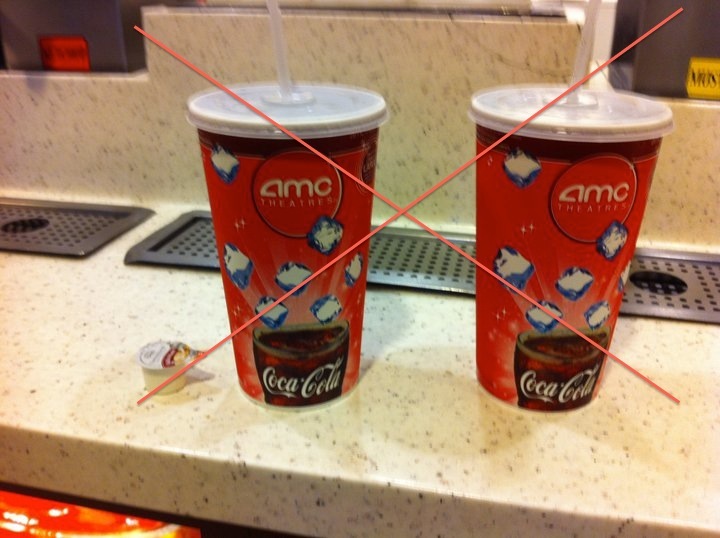 soft drinks at the movie theatre!! Opponents have been crying out that it's an over-corrective action, that the Bloomberg administration is compromising the civil liberties of New York City residents, and that the administration is too caught up in hysterics to realize the impact of what they're doing. Opinions aside, the fact remains that more than half of New York City adults, or 58%, are overweight or obese, and nearly 40% of city public-school students in eighth grade or below are obese or overweight, according to the city. During the mayor's tenure, the Board of Health has required calorie counts to be posted on menu boards and banned the use of trans-fats in foods. The mayor's administration also launched a major effort to limit the intake of salt. Many of the initiatives, at first, were unpopular but public sentiment then changed, the mayor and other administration officials have pointed out. "Two or three years ago, McDonald's sued us to stop posting calorie counts on all menus in New York City," the mayor said on Thursday. Just this week, McDonald's has announced it will continue the practice nationwide. "I'll rest my case, thank you". The mayor has also described the initiative as "portion control," as an upfront way to alert consumers about the dangers of large sugary drinks. While the new rule bans the sale of sugary drinks in large cups, consumers may purchase as many drinks as they choose. "I don't think it's government's job to ban people from doing things with a handful of exceptions," Bloomberg said. "But, generally, it's government's job to tell you the facts of what is bad for you and let you make your own decision." I am ELATED to see some real sustainable action taking place in New York City. Mayor Bloomberg has been chided for his "nannying" policies, but if the public wants lower taxes, we need lower health care costs. Lower rates of hypertension, diabetes and obesity= lower health care costs. He is taking action to protect the interests of the public. We need to remember that "What is right is not always popular; what is popular is not always right." I think NYC residents should be disgusted that there are 36 packets (72 grams) of sugar in a 16 oz coca-cola. The daily intake for a 2000 calorie diet is supposed to be 37-40 grams of sugar in one day. People should be disgusted at how much sugar they are consuming and how much damage they are doing to their bodies. I applaud the efforts of the Bloomberg administration and I am happy that the government can control the access to these sugar bombs. Sugar is just as addicting as nicotine. I don't see how this is any different from the government controlling access to cigarettes. If people really are that offended that their civil liberties are being intruded on, they can go to the supermarket and chug a 2 liter bottle of soda in peace.